Wow my first February post? I remember the same thing happening last year; I was all enthusiastic about craft projects (and home projects for that matter), then I settled back in the routine of full time work and all I wanted to do once home was relax and read other people’s blogs. How do you keep your crafty projects a priority? Today I was home sick, nothing major, just a tummy bug. While relaxing I crocheted up the remaining three of my nine squares. Why nine? Well, it seemed like a good number for a cushion and also not too many to commit to in my still very beginner stage. Nine isn’t quite enough to cover the cushion insert I have lying around… what to do? I could keep going and make 18, I could get a bit creative with fabric to fill in the gaps or… I could just get a smaller cushion because I have other crochet projects to move onto! What would you do? I’d use fabric and then make the nine grannies a feature right in the middle at the front. Thank you! I need to feel better to make it to craft night tomorrow! I did think about a feature in the middle. I’m just not sure how I’d attach it? Hand sew it on? Like the colours, Ren. They caught my eye straight away. If I’ve got too much going on in life, I can’t always be creative. At those times I like to immerse myself in looking at craft, art, nature photography, architecture, etc in books, blogs and real life. It isn’t usually too long before the creativity bug bites again. Well that sounds sensible! My problem is I don’t like to use other people’s patterns/tutorials I like to make my own things so as soon as lack of motivation/inspiration hits I stop doing anything! 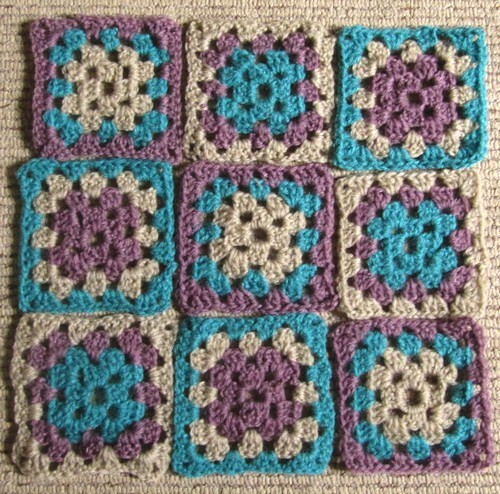 The granny squares actually have helped to show me that it’s ok to undertake projects that aren’t ones own design and they’re fun! Onward with craft! I Love the idea of a fabric border around the squares. 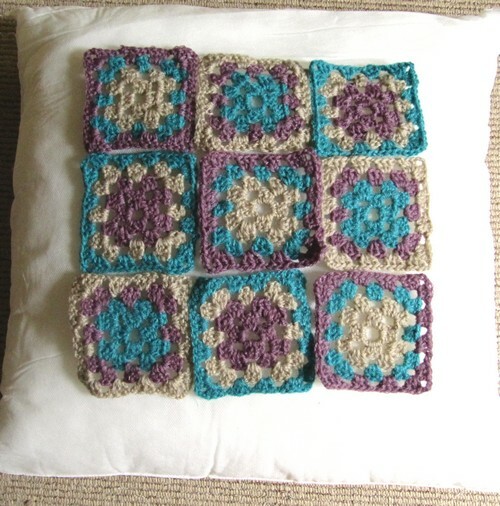 You could even make a cover in the fabric and then applique the crochet on the top of the cushion. Machine stitching borders would work as well.